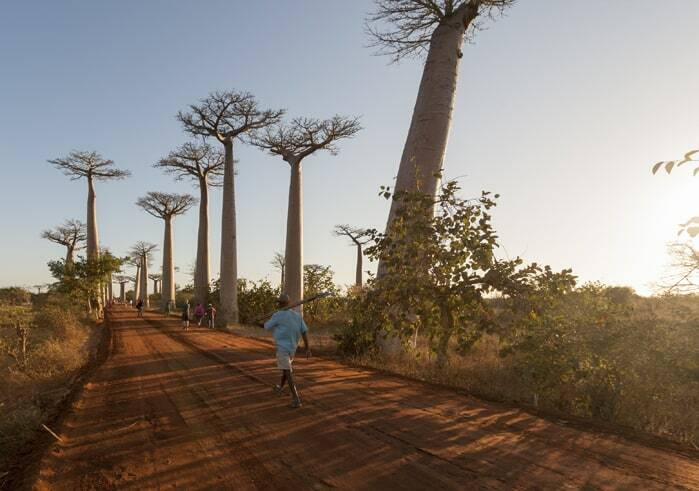 Visiting Madagascar had been a dream of ours for a very long time. We imagined lush rainforests teeming with wildlife. We imagined colorful birds, playful ring-tailed lemurs, chameleons ambling across tree branches and other Madagascar animals as far as the eye could see. When we finally traveled to Madagascar last summer, we found the place amazing and terrible at the same time. Decades of uncontrolled logging led to a loss of nearly 50% of Madagascar’s rainforest between 1950 and 2000. 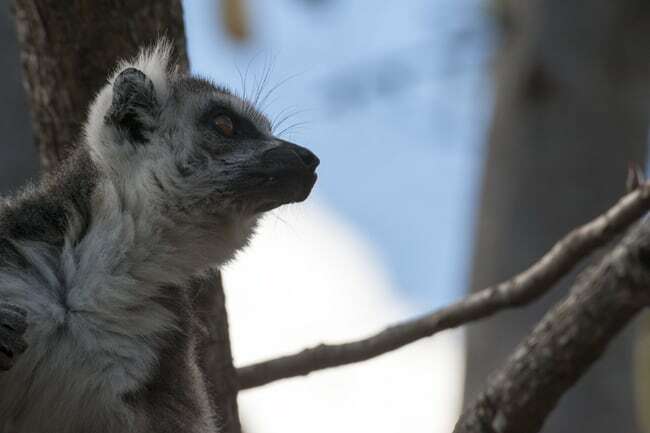 With deforestation came a decrease in biodiversity, with several lemur and other Madagascar animal species (many unique to the country) now endangered or extinct. Luckily, the Malagasy government created a great network of national parks, where poaching and illegal logging are strictly controlled and tourists are only allowed to visit with a guide. The Madagascar I saw in national parks was the one of my dreams, with lush nature and plenty of wildlife to see. 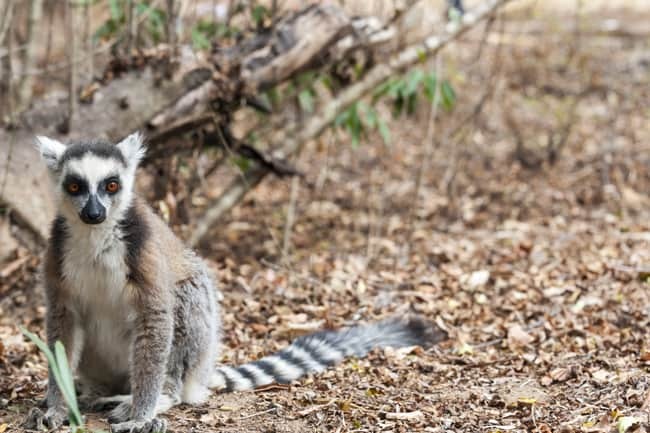 Viewing the wildlife of Madagascar is a completely different experience from safaris in the African savannah. 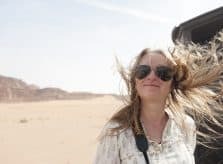 You don’t travel on a vehicle, you walk, led by a skilled guide and pisteurs, a network of animal-spotters that tell the guides where animals are likely to be seen. Madagascar animals are small, and therefore harder to spot. Lemurs are not much larger than a monkey, and some chameleons are no more than a couple of inches long. So spotting them in the wilderness is not at all easy. Still, wildlife-viewing in Madagascar is a wonderful experience. You’ll see animals that cannot be seen anywhere else, as the island is home to more than 800 endemic species, from lemurs and the cat-like fossa (the baddie in the Madagascar movie) to dozens of chameleons and colorful birds. 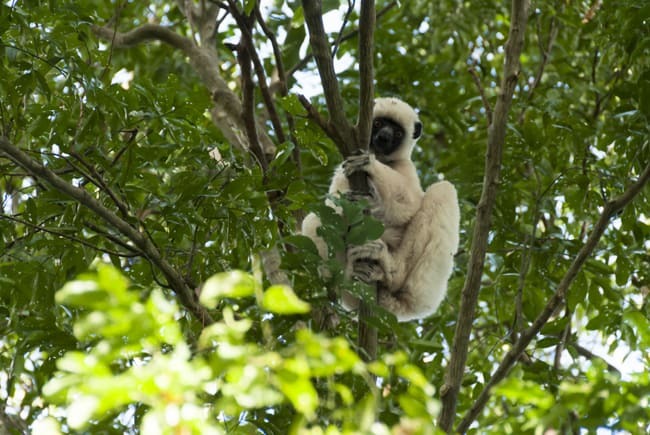 This beautiful Von der Decken’s Sifaka was the first lemur we spotted, during our 3-day hike along the Tsiribihina River. Sifaka are a subspecies of lemurs, with longer limbs and a graceful appearance, and are famous for their sideways “walk-dance.” We saw plenty of sifakas leaping and resting on trees, but, sadly, none of them were dancing. When thinking about lemurs, most people imagine King Julien from the movie Madagascar. The character was inspired by catta or ring-tailed lemurs. Your best bet if you want to spot them will be heading to Anja Reserve near the village of Ambalavao, in central Madagascar. 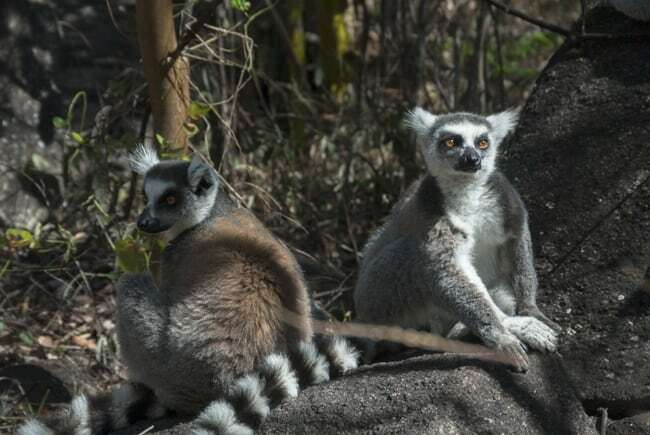 There are over 400 ring-tailed lemurs in a relatively small area there. 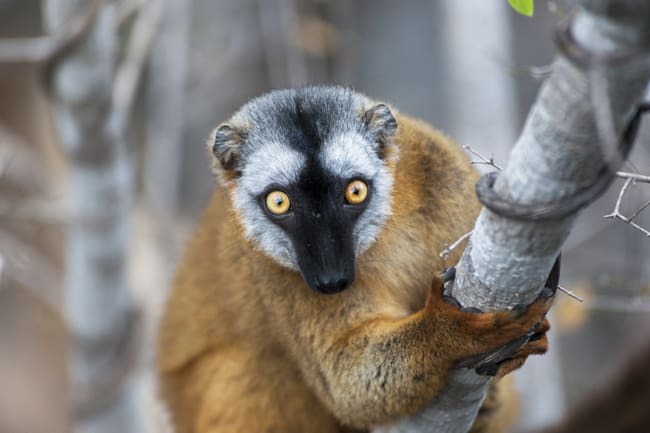 Among the lemurs’ most unique, recognizable features are their hypnotic eyes. 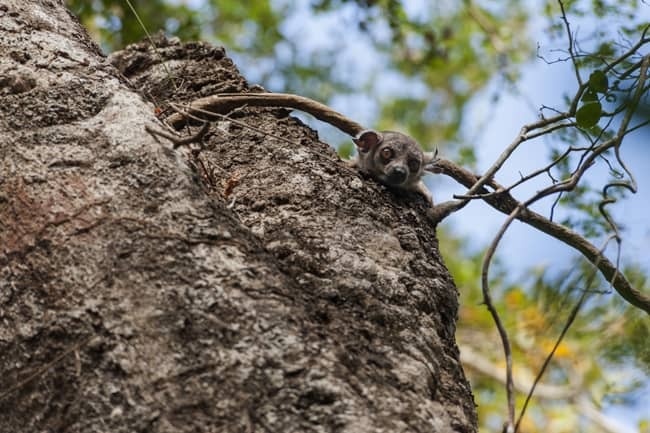 Here you can see why, as this Brown Lemur we spotted in Tsingy de Bemaraha National Park looks like he’s bewitching you, urging you to follow him through the park’s deep forest and canyons. 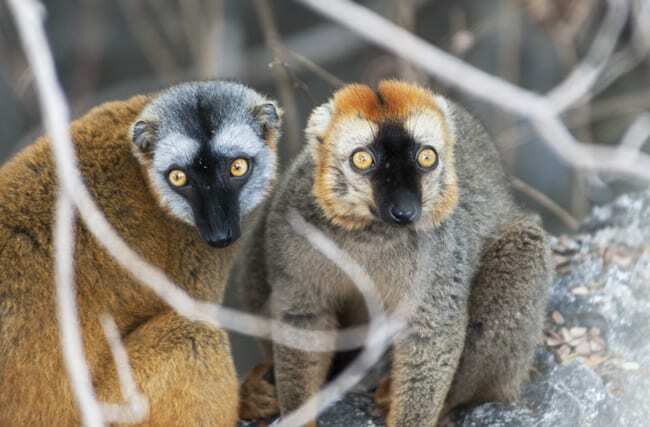 Here we have a cute, color-coordinated Brown Lemur couple– a brown-bodied male with a grey face and a grey-bodied female with a brown-orange face– which we found between the limestone spires of Tsingy de Bemaraha National Park. 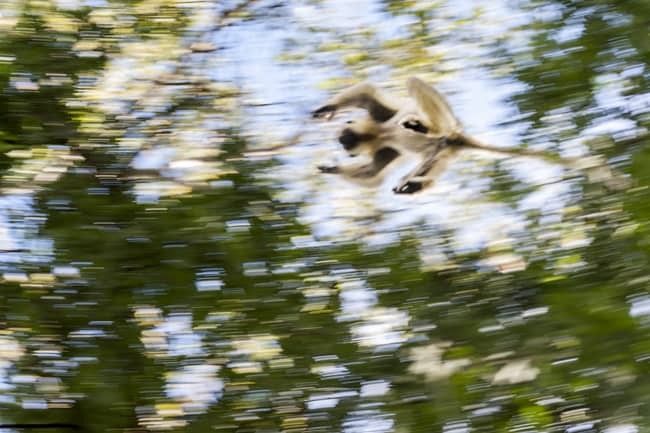 Here, another white Von der Decken’s sifaka leaps from the trees in Tsingy de Bemaraha, showing off his grace and beautiful long limbs. There are 11 species of lemur found in this park, as well as two mongoose (we spotted some, but they’re too fast to photograph) and several bat species. This Sportive Lemur– a nocturnal species we were lucky to see on our way out of Tsingy de Bemaraha– was incredibly difficult to find because of its small size and excellent camouflage skills. Without our guide, there’s no chance we would have spotted it. There’s a lot more to Malagasy wildlife than just lemurs. 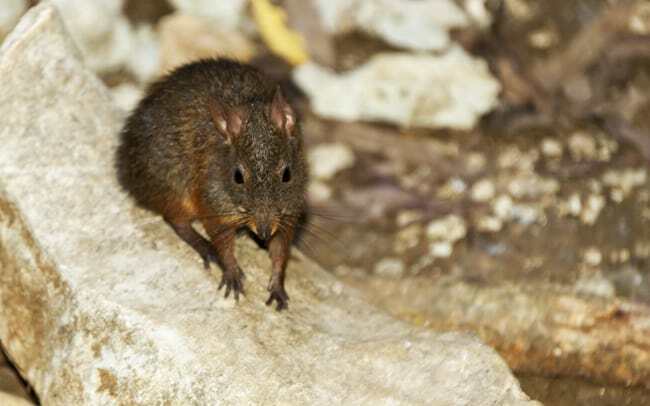 Here’s a Jumping Rat we spotted at the bottom of a canyon in Tsingy de Bemaraha. It was very wary of us at first, jumping away in kangaroo-like bounces. But then it came back and sat still just long enough to be photographed. Chameleons rival lemurs as the most famous species in Madagascar. 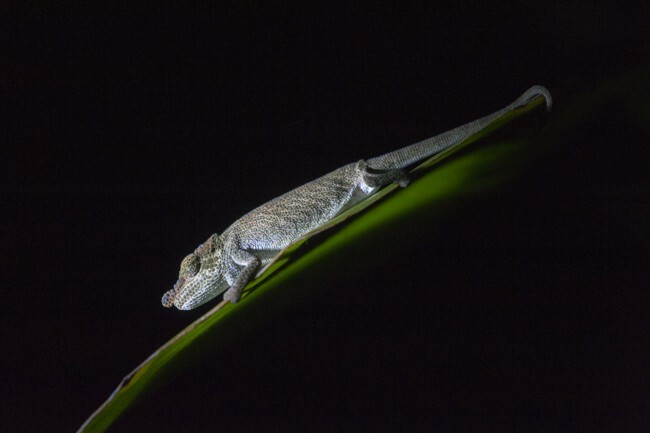 More than half the world’s 150 chameleon species can be found on the island, from 2-foot long animals to tiny ones just half as long as your little finger. 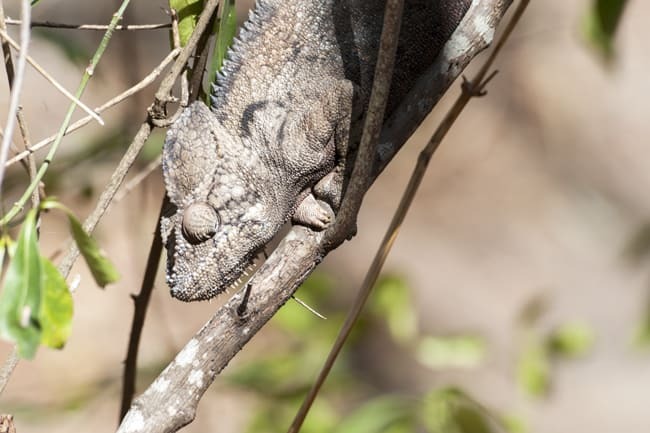 This is one of the largest chameleons we saw there (about 1.5 feet long), well hidden in a bush inside Anja Reserve. The world of reptiles is incredibly varied and colorful in Madagascar. 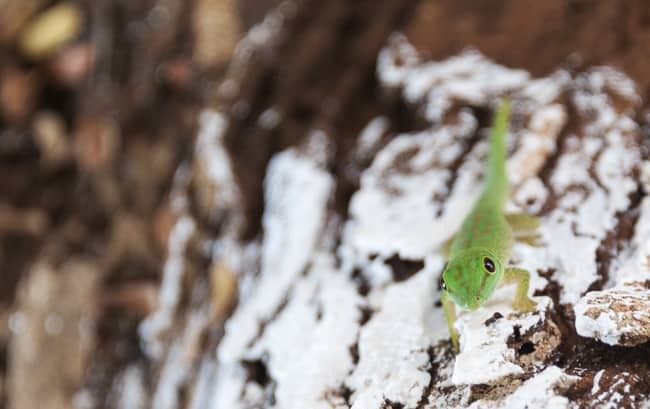 We spotted this bright green Madagascar Day Gecko in a picnic area of Ranomafana National Park, one of the island’s richest parks in terms of wildlife. It’s also one of the hardest to photograph, as most of it is primary rainforest. Quirky animals can be found everywhere on the island. 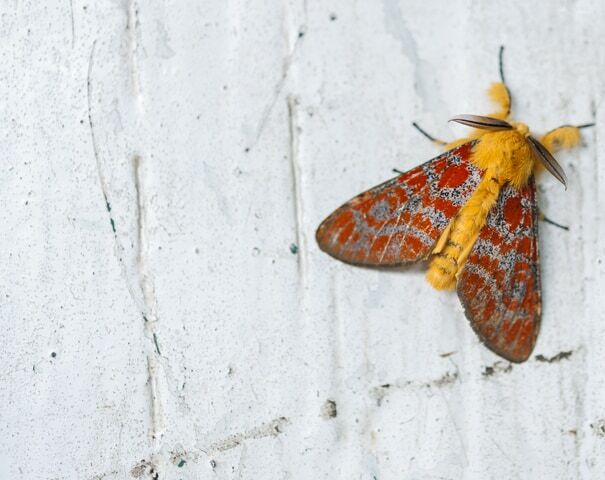 This funky, fuzzy moth flew all around us as we had breakfast in our campsite near the entrance of Ranomafana National Park. Then it stopped for a second on the wall, just long enough for us to take this photograph. 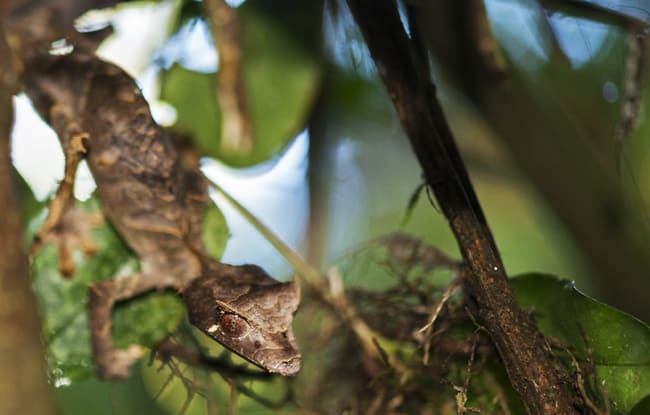 We found this Leaf Tailed Gecko in Ranomafana National Park. The name says it all: This gecko is a master of camouflage, looking just like a leaf not only in terms of colour, but texture as well. We saw this tiny Pygmy Chameleon, which was only a couple of inches long, towards the end of our day hiking around Ranomafana National Park. Madagascar’s endemic wildlife is not limited to mammals and reptiles, but includes many bird species as well. 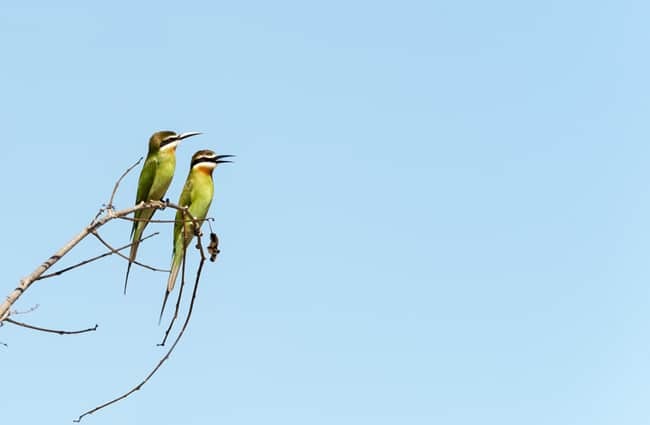 This is a pair of Olive Bee-Eaters we spotted on the banks of the Tsiribihina river. These bright green birds, which are reminiscent of kingfishers, swoop over the riverbanks catching insects in their long, curved beaks. This Madagascar Grass Owl is another bird seen from our pirogue (a small boat) on the Tsiribihina River. 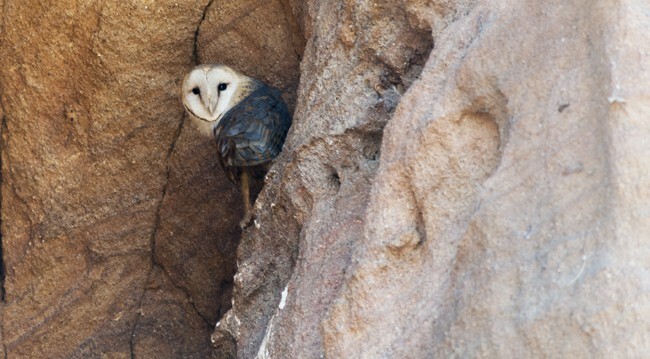 We found him napping between the rocks at twilight, ready to go out at night. Some find them scary, but I’ve always believed spiders are fascinating creatures. 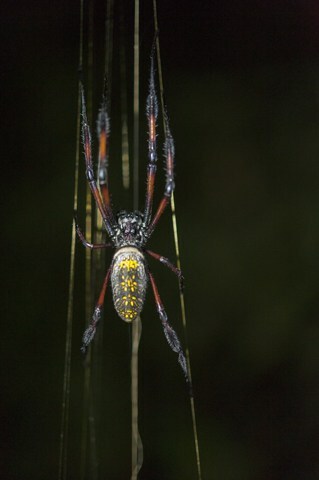 I was happy to spot this beautiful one during our Ranomafana night hike, but my French wasn’t good enough to understand what kind of spider it was. You can also take night tours in Ranomafana, but these explore around the edges of the park rather than in the park itself. You’ll be led around by a ranger with a flashlight, and more likely to spot small reptilians, insects or spiders rather than lemurs. 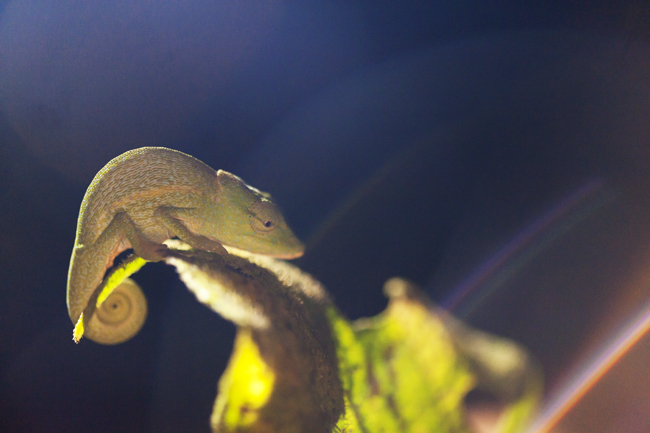 Here is another Pygmy Chameleon we found, stretching out on a leaf.